Fill - gets or sets the brush that describes the fill of the point mark. Stroke - gets or sets the brush that describes the stroke of the point mark. StrokeThickness - gets or sets the stroke thickness of the point mark. Shape- gets or sets the shape of the point mark, which corresponds to a value of the Telerik.Windows.Controls.Charting.MarkerShape enumerator. Currently, changing the point marks appearance could be done only via the provided API. Declarative customizations are not supported. 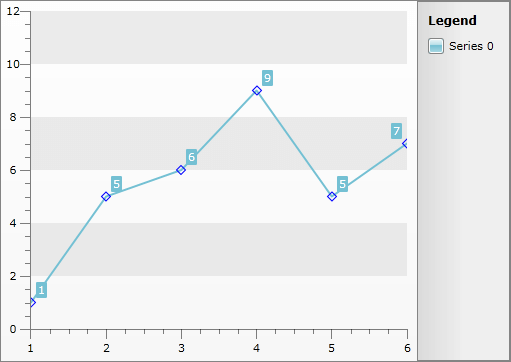 For example, you can change the appearance of the point marks for a LineSeries in the following way. Data="F1 M 6.5,3.5 L 3.5,0.5 0.5,3.5 3.5,6.5 0.5,9.5 3.5,12.5 6.5,9.5 9.5,12.5 12.5,9.5 9.5,6.5 12.5,3.5 9.5,0.5 6.5,3.5 Z"